Shooter Helen Housby believes England's new central contracts are "a step in the right direction" to help the team compete with Australia and New Zealand. Players selected will become full-time athletes, a move which the world's two best teams have already taken. Housby, 21, a zoology student, will now be able to play netball without the need for a full-time job. "To complete against a professional team, you need to be a professional team," she told BBC Sport. "To have athletes that are paid to be there and who can put all their energy and resources into playing netball rather than trying to balance lots of different things in their life is a step in the right direction." England are ranked third in the world, behind 11-time World Cup winners Australia and second-placed New Zealand. The Roses have finished third in the last two tournaments and are aiming to reach the final at the next World Cup in Liverpool in 2019. Full-time status will also allow the England side to train together more regularly. "We want to be the world's best. At the minute we are not but hopefully this is something that will get us there," added Housby, who plays for Manchester Thunder. "We have the best athletes in the world, but it is difficult to get the best out of them when we don't have the same conditions that Australia and New Zealand do." Full details of the central contracts will be announced following the conclusion of the Superleague season in May. "I find it almost unbelievable that it has not been paid before now," Housby continued. "It is the highest participating sport for women in England. People do not know the effort that goes on behind the scenes and it is nice to get some recognition." Housby, who is in her final year at Manchester University and does not receive a wage at the Thunder, was always planning to concentrate on her netball after graduating. She had considered playing in the professional ANZ Championship, a competition for the best Australian and New Zealand teams, but says the new contracts will allow her to stay in England. "It is nice to have something to support me while I play rather than have to find my own job and balance things. It excites me that I could have a solid income and job through netball," she said. "Superleague needs to catch up to the ANZ. Some of our best players are out there playing for teams and making money from it. The only way England can improve is to match these leagues and make the players want to stay here and play." Housby believes the incentive of being paid to play will also help attract more girls into the sport. "For a lot of girls growing up, netball has not been a viable career option. 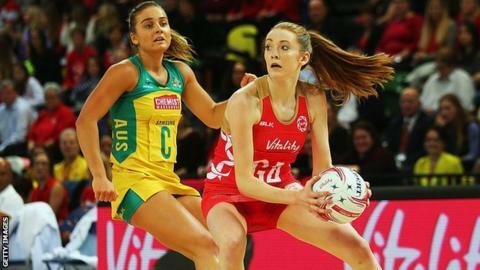 That is where England netball wants to head so people can choose this as their career and make something of themselves."